An injured turtle is riding in style thanks to zoo keepers at The Maryland Zoo. 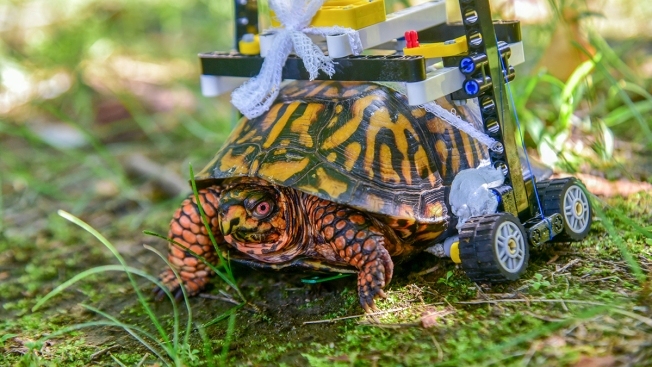 The wild eastern box turtle has been outfitted with a wheelchair made of Lego bricks. A zoo employee found the injured turtle in Druid Hill Park in Baltimore, Maryland, in July. "He had multiple fractures on his plastron, the bottom part of his shell," said Dr. Ellen Bronson, senior director of animal health, conservation, and research at the zoo. The turtle underwent surgery to fix its fractured shell. The zoo's veterinary team used metal bone plates, sewing clasps and surgical wire to hold pieces of the turtle's fractured shell together. The shell had to stay off the ground in order to heal, posing a challenge to staffers who had a hard time helping the turtle get around in the meantime. That's when someone came up with the idea of the Lego wheelchair. "They don’t make turtle-sized wheelchairs. So, we drew some sketches of a customized wheelchair and I sent them to a friend who is a Lego enthusiast," said Garrett Fraess, veterinary extern at the Zoo. A few weeks later, the grapefruit-sized turtle received his own custom Lego wheelchair. Zoo officials say the turtle took off as soon as he was outfitted with the miniature design. "He never even hesitated," said Fraess. "He took off and has been doing great. Turtles are really good at healing as long as the shell remains stable."